Seattle’s transportation department wants to take over the troubled, insolvent program. The City Council will be asked next week to approve $1.4 million to buy it. Seattle’s bike-share program, Pronto, is insolvent, and the city must buy it or it may shut down. “The current system will not be operational in early 2016 without intervention,” according to a summary of a bill to be discussed Tuesday during the City Council’s Transportation and Sustainability Committee meeting. The bike-share program started in October 2014 with 500 bikes and about 50 stations in the U-District, Capitol Hill and downtown Seattle. Although a nonprofit manages Pronto, day-to-day operations are handled by a private company called Motivate. Ridership has lagged. According to Pronto data, most bikes were ridden less than once a day, on average, from October 2014 to October 2015. Purchasing Pronto’s assets would cost the city $1.4 million. Seattle would owe the federal government $1 million if the bike-sharing program stops operating because of a loan agreement. Mayor Ed Murray included $5 million in this year’s budget to buy and expand Pronto, but the City Council put a hold on the transportation department’s use of the money until it has studied how best to grow the bike-share service. Many have said the bike-share system will succeed only by reaching more neighborhoods. 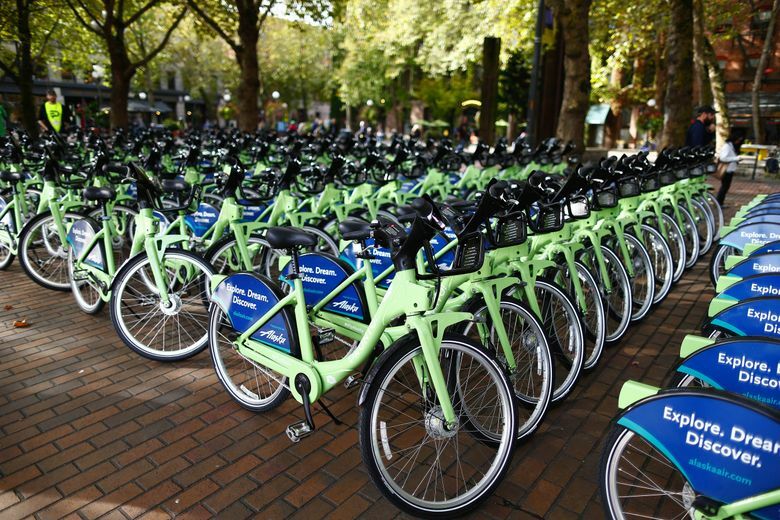 Nicole Freedman, who is leading the bike-share efforts for the Seattle Department of Transportation (SDOT), said the council has to first approve keeping Pronto afloat. “We’re asking for City Council to approve the purchase of Pronto assets, stabilize the system, and then come back with detailed expansion information,” she said. Councilmember Mike O’Brien, who chairs the Transportation and Sustainability Committee, said he was disappointed to see Pronto “go financially sideways so quick” and said he’ll have to carefully consider whether to fund it. Freedman said if the city owns Pronto’s equipment outright, “the system will actually break even” between sponsorships and user memberships. Why Pronto is in such bad financial shape now is up for some debate. In the documents sent to the council, SDOT said Pronto was insolvent because it did not raise enough money before launching, has “substantial overhead costs” and racked up debt. But Holly Houser, who was Pronto’s executive director through August, said the nonprofit was financially healthy until the city came calling about acquisition. “The reason why the bike-share system is facing insolvency is not because the nonprofit was irresponsible with money. It’s because the city has had these ongoing delays in acquisition,” she said. Houser said the nonprofit stopped seeking grants and raising money because the city indicated it wanted to take ownership by the end of August. She found a new job that began last September, but has stayed on as a contractor as the acquisition was delayed. “We told them in May, ‘If we don’t bring in more money, if you don’t get these (federal) grant funds, we are going to run out of money for operations by the end of 2015,’ ” Houser said. Last fall, SDOT sought millions in federal grant money to add stations across the city and possibly add electric bikes to the fleet, but the government chose not to fund the project. Houser said Pronto had only two employees. She said her salary was $75,000 a year and her colleague was paid $45,000. Freedman said it would be more efficient for the city to deal directly with Motivate, but the city is benefiting from the nonprofit’s “sweat equity” to get the system up and running. In a 2014 financing statement for a bank loan, all of Pronto’s assets and inventory were listed as collateral. Both Houser and Freedman said they hoped the council would approve the purchase, and noted that other cities own their bike-share programs.